Celebrate your special evening in this short wedding-guest dress that combines feminine lace and figure-flattering style. This lovely party dress features a beautiful lace bodice with embroidered applique at the high-neck detail. The applique cascades down the front of the v-neckline in intricate patterns, diminishing the need for jewelry. The scalloped choker collar wraps around the neck before connecting to two vertical bands that cross over the open back. In wrinkle-resistant scuba fabric, the pleated a-line skirt looks fresh and crisp, even after a long night of dancing. 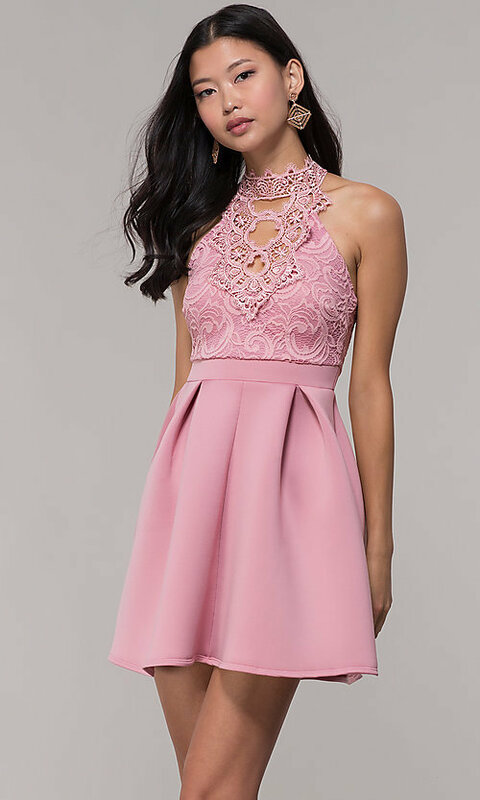 Ideal for wedding ceremonies, homecoming dances, and sweet-sixteen parties, this short wedding-guest dress, under $100, is affordably priced and easy to love.